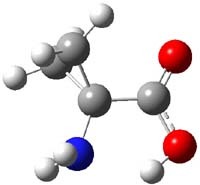 Continuing their application of laser ablation molecular beam Fourier transform microwave (LA-MB-FTMW) spectroscopy and computational chemistry to biochemical molecules (see these previous posts), the Alonso group reports on the structure of the glycine-glycine dipeptide 1.1 The microwave spectrum shows three different conformers. MP2/6-311++G(d,p) computations, the same method they have previously utilized for predicting geometries, revealed a number of different conformations. 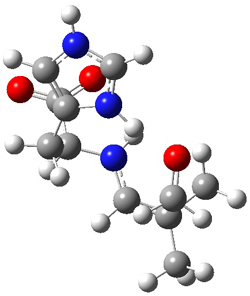 By matching the spectroscopic parameters obtained from the spectrum with those of the computed structures, they proposed the three conformations 1a, 1b, and 1c, shown in Figure 1. Figure 1. ωb97xd/6-31G(d) optimized structures of the three conformers of 1. Note that the authors did not report their structures in their supporting materials(!) so I have optimized them. The structures of conformers 1a and 1b are nearly planar. 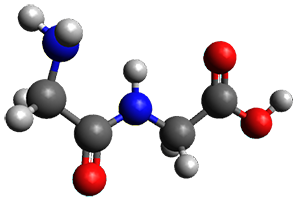 MP2 predicts a non-planar rotomer of 1a, which brings the carboxyl group out of plane, to be the lowest conformation in terms of electronic energy. With the M06-2x functional, this non-planar rotomer is about isoenergetic with 1a. With all computational levels 1a is the lowest in free energy. The barrier for rotation between the non-planar rotomer and 1a is very small, and this explains why it is not observed in the supersonic expansion. 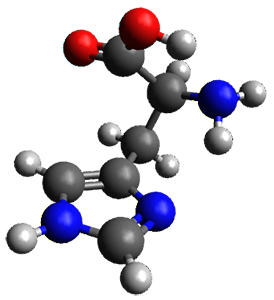 1) Cabezas, C.; Varela, M.; Alonso, J. L., "The Structure of the Elusive Simplest Dipeptide Gly-Gly." Angew. Chem. Int. Ed. 2017, 56, 6420-6425, DOI: 10.1002/anie.201702425. 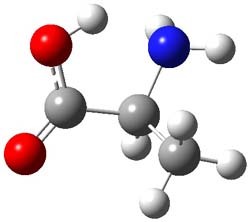 There are three generic conformations of α-amino acids in the gas phase: A-C. These are stabilized by intramolecular hydrogen bonds. 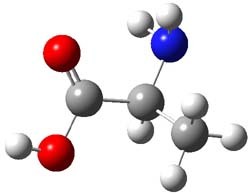 While computations suggest that all three are close in energy, the very detailed laser ablation- molecular beam-Fourier transform microwave (LA-MB-FTMW) experiments of the Alonso group (mentioned in these previous posts: guanine, cysteine, ephedrine) have identified only the first two conformations. 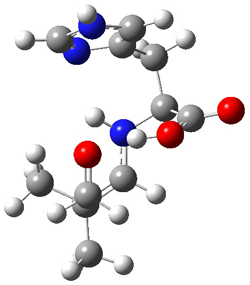 Cooling of the structures in the jet expansion appears to be the reason for the loss of the (slightly) higher energy conformer C.
Alonso now reports on the structure of 1-aminocyclopropanecarboxylic acid 1.1 The three MP2/6-311+G(d,p) optimized conformation are shown in Figure 1. The interaction between the cyclopropyl orbitals and the carbonyl π-bond suggests that only two structures (where the carbonyl bisects thecyclopropyl plane) will exist and that rotation between them may require passage through a prohibitively high barrier. In fact, computations suggest a barrier of 2000 cm-1 (5.7 kcal mol-1). 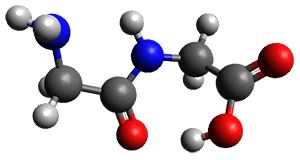 This is much larger than the typical rotation barrier of the amino acids that interconvert A with C, which are about 400 cm-1 (1 kcal mol-1). After careful examination of the microwave spectrum, all three conformations 1A-C were identified by comparing the experimental value of the rotational constants, and 14N nuclearquadrupole coupling constants with the computed values. Really excellent agreement is found, including in the ratio of the relative amounts of the three isomers. Once again, we have an exquisite example of the importance of computations and experiments being used in conjunction to solve interesting chemical problems. Arginine, on the other hand, appears to require only one water molecule to make the zwitterion lower in energy than the neutral form.3 The B3LYP/6-311++G** structures of the lowest energy neutral (1N) and zwitterion (1Z) cluster with one water are shown in Figure 1. 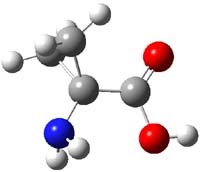 The zwitterion is 1.68 kcal mol-1 lower in energy. 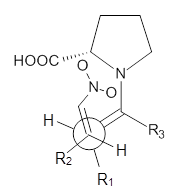 What makes this zwitterion so favorable is that the protonation occurs on the guanidine group, not on the amine group. The guanidine group is more basic than the amine. 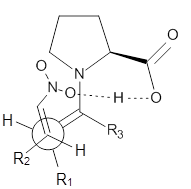 Further, the water can accept a proton from both nitrogens of the guanidine and donate a proton to the carboxylate group. 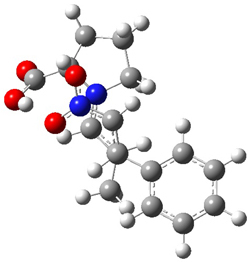 (1) Aikens, C. M.; Gordon, M. S., "Incremental Solvation of Nonionized and Zwitterionic Glycine," J. Am. Chem. Soc., 2006, 128, 12835-12850, DOI: 10.1021/ja062842p. 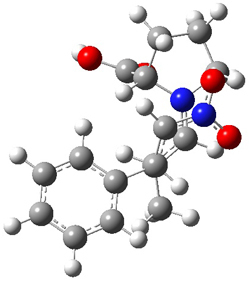 (2) Bachrach, S. M., "Microsolvation of Glycine: A DFT Study," j. Phys. Chem. A, 2008, 112, 3722-3730, DOI: 10.1021/jp711048c. 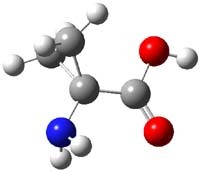 (3) Im, S.; Jang, S.-W.; Lee, S.; Lee, Y.; Kim, B., "Arginine Zwitterion is More Stable than the Canonical Form when Solvated by a Water Molecule," J. Phys. Chem. A, 2008, 112, 9767-9770, DOI: 10.1021/jp801933y.